Adding face for day 6. I painted this with Matisse & Americana Paints.We are having very warm weather here at the moment, so paints are drying very fast. Enjoying the Challenge, looking forward to see what tomorrow brings. 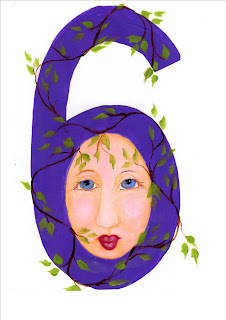 Love that you drew her in a 6! Your conceptualizing is fun! Here's to originality! 6 - lol - well done!